Rococo (/rəˈkoʊkoʊ/ or /roʊkəˈkoʊ/), less commonly roccoco, or "Late Baroque", is a highly ornamental and theatrical style of decoration which combines asymmetry, scrolling curves, gilding, white and pastel colors, sculpted molding, and trompe l'oeil frescoes to create the illusions of surprise, motion and drama. It first appeared in France and Italy in the 1730s and spread to Central Europe in the 1750s and 1760s. It is often described as the final expression of the Baroque movement. The Rococo style began in France in the first part of the 18th century in the reign of Louis XV as a reaction against the more formal and geometric Style Louis XIV. It was known as the style rocaille, or rocaille style. It soon spread to other parts of Europe, particularly northern Italy, Bavaria, Austria, other parts of Germany, and Russia. It also came to influence the other arts, particularly sculpture, furniture, silverware and glassware, painting, music, and theatre. The word rococo was first used as a humorous variation of the word rocaille. Rocaille was originally a method of decoration, using pebbles, seashells and cement, which was often used to decorate grottoes and fountains since the Renaissance. In the late 17th and early 18th century rocaille became the term for a kind of decorative motif or ornament that appeared in the late Style Louis XIV, in the form of a seashell interlaced with acanthus leaves. In 1736 the designer and jeweler Jean Mondon published the Premier Livre de forme rocquaille et cartel, a collection of designs for ornaments of furniture and interior decoration. It was the first appearance in print of the term "rocaille" to designate the style. The carved or molded seashell motif was combined with palm leaves or twisting vines to decorate doorways, furniture, wall panels and other architectural elements. The term rococo was first used in print in 1825 to describe decoration which was "out of style and old-fashioned." 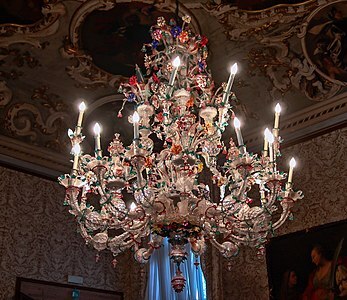 It was used in 1828 for decoration "which belonged to the style of the 18th century, overloaded with twisting ornaments." In 1829 the author Stendhal described rococo as "the rocaille style of the 18th century." In the 19th century, the term was used to describe architecture or music which was excessively ornamental. Since the mid-19th century, the term has been accepted by art historians. While there is still some debate about the historical significance of the style, Rococo is now often considered as a distinct period in the development of European art. Rococo features exuberant decoration, with an abundance of curves, counter-curves, undulations and elements modeled on nature. The exteriors of Rococo buildings are often simple, while the interiors are entirely dominated by their ornament. The style was highly theatrical, designed to impress and awe at first sight. Floor plans of churches were often complex, featuring interlocking ovals; In palaces, grand stairways became centrepieces, and offered different points of view of the decoration. 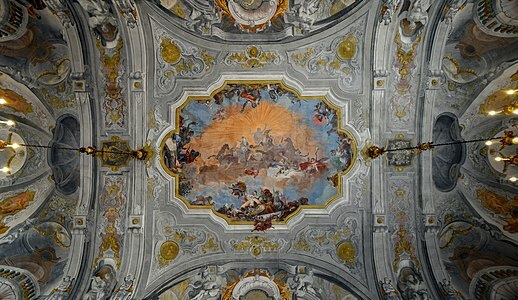 The style often integrated painting, molded stucco, and wood carving, and quadratura, or illusionist ceiling paintings, which were designed to give the impression that those entering the room were looking up at the sky, where cherubs and other figures were gazing down at them. Materials used included stucco, either painted or left white; combinations of different colored woods; lacquered wood in the Japanese style, and ornament of gilded bronze. The intent was to create an impression of surprise, awe and wonder on first view. Rococo was also influenced by chinoiserie and was sometimes in association with Chinese figures and pagodas. The Rocaille style, or French Rococo, appeared in Paris during the reign of Louis XV, and flourished between about 1723 and 1759. The style was used particularly in salons, a new style of room designed to impress and entertain guests. The most prominent example was the salon of the Princess in Hôtel de Soubise in Paris, designed by Germain Boffrand and Charles-Joseph Natoire (1735–40). The characteristics of French Rococo included exceptional artistry, especially in the complex frames made for mirrors and paintings, which sculpted in plaster and often gilded; and the use of vegetal forms (vines, leaves, flowers) intertwined in complex designs. The furniture also featured sinuous curves and vegetal designs. The leading furniture designers and craftsmen in the style included Juste-Aurele Meissonier, Charles Cressent, and Nicolas Pineau. The Rocaille style lasted in France until the mid-18th century, and while it became more curving and vegetal, it never achieved the extravagant exuberance of the Rococo in Bavaria, Austria and Italy. The discoveries of Roman antiquities beginning in 1738 at Herculanum and especially at Pompeii in 1748 turned French architecture in the direction of the more symmetrical and less flamboyant neo-classicism. 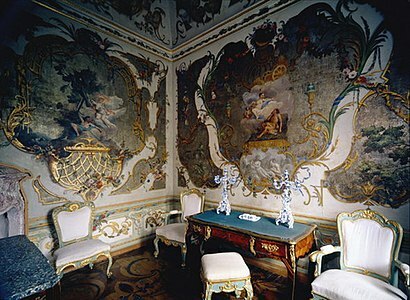 The Rococo decorative style reached its summit in southern Germany and central Europe from the 1730s until the 1770s. 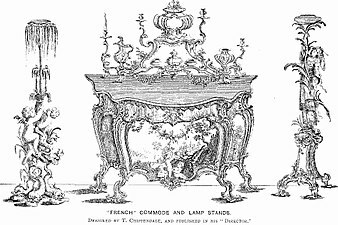 It was first introduced from France through the publications and works of French architects and decorators, including the sculptor Claude III Audran, the interior designer Gilles-Marie Oppenordt, the architect Germain Boffrand, the sculptor Jean Mondon, and the draftsman and engraver Pierre Lepautre. Their work had an important influence on the German Rococo style. German architects adapted the Rococo style but made it far more asymmetric and loaded with more ornate decoration than the French original. The German style was characterized by an explosion of forms that cascaded down the walls. It featured molding formed into curves and counter-curves, twisting and turning patterns, ceilings and walls with no right angles, and stucco foliage which seemed to be creeping up the walls and across the ceiling. The decoration was often gilded or silvered to give it contrast with the white or pale pastel walls. 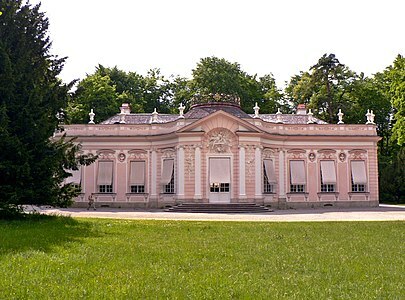 The Belgian-born architect and designer François de Cuvilliés was one of the first to create a Rococo building in Germany, with the pavilion of Amalienburg in Munich, (1734-1739), inspired by the pavilions of the Trianon and Marly in France. It was built as a hunting lodge, with a platform on the roof for shooting pheasants. The Hall of Mirrors in the interior, by the painter and stucco sculptor Johann Baptist Zimmermann, was far more exuberant than any French Rococo. Another notable example of the early German Rococo is Würzburg Residence (1737–1744) constructed for the Prince-Bishop of Wurzburg by Balthasar Neumann. Neumann had traveled to Paris and consulted with the French rocaille decorative artists Germain Boffrand and Robert de Cotte. While the exterior was in more sober Baroque style, the interior, particularly the stairways and ceilings, was much lighter and decorative. 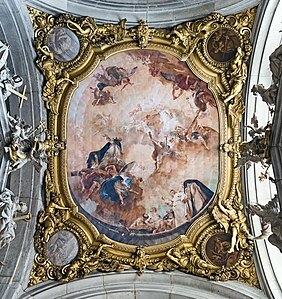 The Prince-Bishop imported the Italian Rococo painter Giovanni Battista Tiepolo in 1750–53 to create a mural over the top of the three-level ceremonial stairway. Neumann described the interior of the residence as "a theater of light". The stairway was also the central element in a residence Neumann built at the Augustusburg Palace in Brühl (1743–1748). In that building the stairway led the visitors up through a stucco fantasy of paintings, sculpture, ironwork and decoration, with surprising views at every turn. 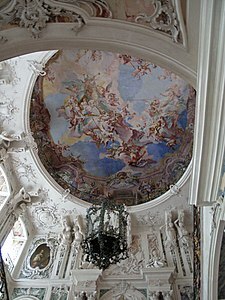 In the 1740s and 1750s, a number of notable pilgrimage churches were constructed in Bavaria, with interiors decorated in a distinctive variant of the rococo style. One of the most notable examples is the Wieskirche (1745–1754) designed by Dominikus Zimmermann. Like most of the Bavarian pilgrimage churches, the exterior is very simple, with pastel walls, and little ornament. Entering the church the visitor encounters an astonishing theater of movement and light. It features an oval-shaped sanctuary, and a deambulatory in the same form, filling in the church with light from all sides. The white walls contrasted with columns of blue and pink stucco in the choir, and the domed ceiling surrounded by plaster angels below a dome representing the heavens crowded with colorful Biblical figures. Other notable pilgrimage churches include the Basilica of the Fourteen Holy Helpers by Balthasar Neumann (1743–1772). Johann Michael Fischer was the architect of Ottobeuren Abbey (1748–1766), another Bavarian Rococo landmark. The church features, like much of the rococo architecture in Germany, a remarkable contrast between the regularity of the facade and the overabundance of decoration in the interior. The Russian Empress Catherine the Great was another admirer of the Rococo; The Golden Cabinet of the Chinese Palace in the palace complex of Oranienbaum near Saint Petersburg, designed by the Italian Antonio Rinaldi, is an example of the Russian Rococo. 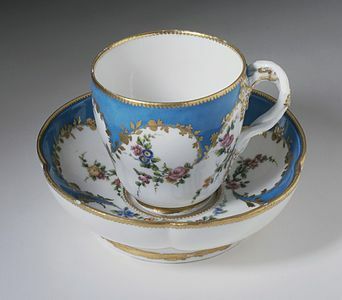 In Great Britain, rococo was called the "French taste" and had less influence on design and the decorative arts than in continental Europe, although its influence was felt in such areas as silverwork, porcelain, and silks. William Hogarth helped develop a theoretical foundation for Rococo beauty. Though not mentioning rococo by name, he argued in his Analysis of Beauty (1753) that the undulating lines and S-curves prominent in Rococo were the basis for grace and beauty in art or nature (unlike the straight line or the circle in Classicism). Rococo was slow in arriving in England. Before entering the Rococo, British furniture for a time followed the neoclassical Palladian model under designer William Kent, who designed for Lord Burlington and other important patrons of the arts. Kent travelled to Italy with Lord Burlington between 1712 and 1720, and brought back many models and ideas from Palladio. He designed the furniture for Hampton Court Palace (1732), Lord Burlington's Chiswick House (1729), London, Thomas Coke's Holkham Hall, Norfolk, Robert Walpole's pile at Houghton, for Devonshire House in London, and at Rousham. Mahogany made its appearance in England in about 1720, and immediately became popular for furniture, along with walnut wood. 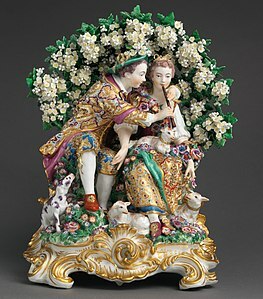 The Rococo began to make an appearance in England between 1740 and 1750. 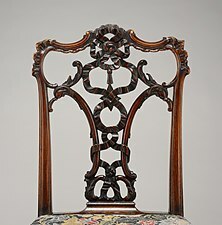 The furniture of Thomas Chippendale was the closest to the Rococo style, In 1754 he published "Gentleman's and Cabinet-makers' directory", a catalog of designs for rococo, chinoiserie and even Gothic furniture, which achieved wide popularity, going through three editions. 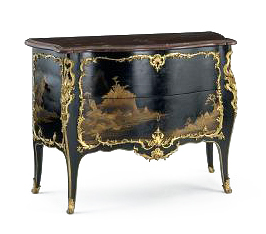 Unlike French designers, Chippendale did not employ marquetry or inlays in his furniture. The predominant designer of inlaid furniture were Vile and Cob, the cabinet-makers for King George III. Another important figure in British furniture was Thomas Johnson, who in 1761, very late in the period, published a catalog of Rococo furniture designs. These include furnishings based on rather fantastic Chinese and Indian motifs, including a canopy bed crowned by a Chinese pagoda (now in the Victoria and Albert Museum). 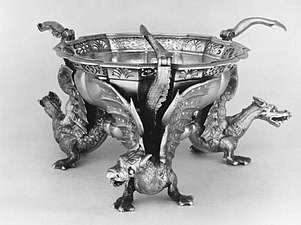 Other notable figures in the British Rococo included the silversmith Charles Friedrich Kandler. The art of Boucher and other painters of the period, with its emphasis on decorative mythology and gallantry, soon inspired a reaction, and a demand for more "noble" themes. While the Rococo continued in Germany and Austria, the French Academy in Rome began to teach the classic style. This was confirmed by the nomination of Le Troy as director of the Academy in 1738, and then in 1751 by Charles-Joseph Natoire. Madame de Pompadour, the mistress of Louis XV contributed to the decline of the Rococo style. In 1750 she sent her nephew, Abel-François Poisson de Vandières, on a two-year mission to study artistic and archeological developments in Italy. He was accompanied by several artists, including the engraver Nicolas Cochin and the architect Soufflot. They returned to Paris with a passion for classical art. Vandiéres became the Marquis of Marigny, and was named director general of the King's Buildings. He turned official French architecture toward the neoclassical. Cochin became an important art critic; he denounced the petit style of Boucher, and called for a grand style with a new emphasis on antiquity and nobility in the academies of painting and architecture. The beginning of the end for Rococo came in the early 1760s as figures like Voltaire and Jacques-François Blondel began to voice their criticism of the superficiality and degeneracy of the art. Blondel decried the "ridiculous jumble of shells, dragons, reeds, palm-trees and plants" in contemporary interiors. By 1785, Rococo had passed out of fashion in France, replaced by the order and seriousness of Neoclassical artists like Jacques-Louis David. In Germany, late 18th-century Rococo was ridiculed as Zopf und Perücke ("pigtail and periwig"), and this phase is sometimes referred to as Zopfstil. Rococo remained popular in the provinces and in Italy, until the second phase of neoclassicism, "Empire style", arrived with Napoleonic governments and swept Rococo away. The ornamental style called rocaille emerged in France between 1710 and 1750, mostly during the regency and reign of Louis XV; the style was also called Louis Quinze. Its principal characteristics were picturesque detail, curves and counter-curves, asymmetry, and a theatrical exuberance. On the walls of new Paris salons, the twisting and winding designs, usually made of gilded or painted stucco, wound around the doorways and mirrors like vines. One of the earliest examples was the Hôtel Soubise in Paris (1704–05), with its famous oval salon decorated with paintings by Boucher, and Charles-Joseph Natoire. The best known French furniture designer of the period was Juste-Aurèle Meissonnier (1695–1750), who was also a sculptor, painter. and goldsmith for the royal household. He held the title of official designer to the Chamber and Cabinet of Louis XV. His work is well known today because of the enormous number of engravings made of his work which popularized the style throughout Europe. He designed works for the royal families of Poland and Portugal. Italy was another place where the Rococo flourished, both in its early and later phases. Craftsmen in Rome, Milan and Venice all produced lavishly decorated furniture and decorative items. The sculpted decoration included fleurettes, palmettes, seashells, and foliage, carved in wood. The most extravagant rocaille forms were found in the consoles, tables designed to stand against walls. The Commodes, or chests, which had first appeared under Louis XIV, were richly decorated with rocaille ornament made of gilded bronze. They were made by master craftsmen including Jean-Pierre Latz and also featured marquetry of different-coloured woods, sometimes placed in checkerboard cubic patterns, made with light and dark woods. The period also saw the arrival of Chinoiserie, often in the form of lacquered and gilded commodes, called falcon de Chine of Vernis Martin, after the ebenist who introduced the technique to France. Ormolu, or gilded bronze, was used by master craftsmen including Jean-Pierre Latz. Latz made a particularly ornate clock mounted atop a cartonnier for Frederick the Great for his palace in Potsdam. Pieces of imported Chinese porcelain were often mounted in ormolu (gilded bronze) rococo settings for display on tables or consoles in salons. Other craftsmen imitated the Japanese art of lacquered furniture, and produced commodes with Japanese motifs. British Rococo tended to be more restrained. 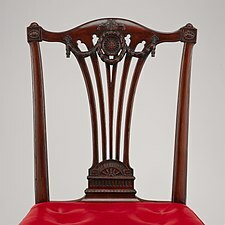 Thomas Chippendale's furniture designs kept the curves and feel, but stopped short of the French heights of whimsy. The most successful exponent of British Rococo was probably Thomas Johnson, a gifted carver and furniture designer working in London in the mid-18th century. 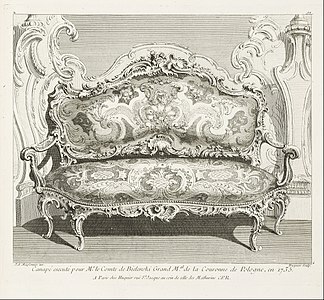 Elements of the Rocaille style appeared in the work of some French painters, including a taste for the picturesque in details; curves and counter-curves; and dissymmetry which replaced the movement of the baroque with exuberance, though the French rocaille never reached the extravagance of the Germanic rococo. The leading proponent was Antoine Watteau, particularly in Pilgrimage on the Isle of Cythera (1717), Louvre, in a genre called Fête Galante depicting scenes of young nobles gathered together to celebrate in a pastoral setting. Watteau died in 1721 at the age of thirty-seven, but his work continued to have influence through the rest of the century. 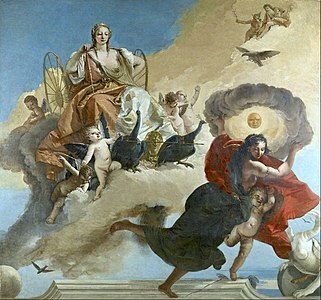 The Pilgrimage to Cythera painting was purchased by Frederick the Great of Prussia in 1752 or 1765 to decorate his palace of Charlottenberg in Berlin. The successor of Watteau and the Féte Galante in decorative painting was François Boucher (1703–1770), the favorite painter of Madame de Pompadour. His work included the sensual Toilette de Venus (1746), which became one of the best known examples of the style. Boucher participated in all of the genres of the time, designing tapestries, models for porcelain sculpture, set decorations for the Paris opera and opera-comique, and decor for the Fair of Saint-Laurent. Other important painters of the Fête Galante style included Nicolas Lancret and Jean-Baptiste Pater. The style particularly influenced François Lemoyne, who painted the lavish decoration of the ceiling of the Salon of Hercules at the Palace of Versailles, completed in 1735. Paintings with fétes gallant and mythological themes by Boucher, Pierre-Charles Trémolières and Charles-Joseph Natoire decorated the famous salon of the Hôtel Soubise in Paris (1735–40). Other Rococo painters include: Jean François de Troy (1679–1752), Jean-Baptiste van Loo (1685–1745), his two sons Louis-Michel van Loo (1707–1771) and Charles-Amédée-Philippe van Loo (1719–1795), his younger brother Charles-André van Loo (1705–1765), and Nicolas Lancret (1690–1743). Rococo sculpture was theatrical, colorful and dynamic, giving a sense of movement in every direction. It was most commonly found in the interiors of churches, usually closely integrated with painting and the architecture. 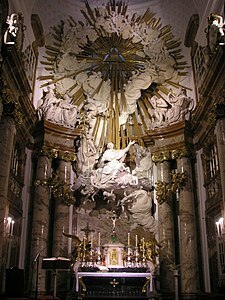 Religious sculpture followed the Italian baroque style, as exemplified in the theatrical altarpiece of the Karlskirche in Vienna. Early Rococo or Rocaille sculpture in France sculpture was lighter and offered more movement than the classical style of Louis XIV. It was encouraged in particular by Madame de Pompadour, mistress of Louis XV, who commissioned many works for her chateaux and gardens. 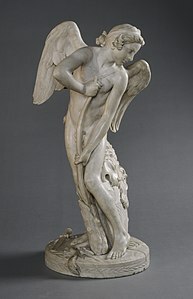 The sculptor Edmé Bouchardon represented Cupid engaged in carving his darts of love from the club of Hercules. Rococo figures also crowded the later fountains at Versailles, such as the Fountain of Neptune by Lambert-Sigisbert Adam and Nicolas-Sebastien Adam (1740). Based on their success at Versailles, they were invited to Prussia by Frederick the Great to create fountain sculpture for Sanssouci Palace, Prussia (1740s). 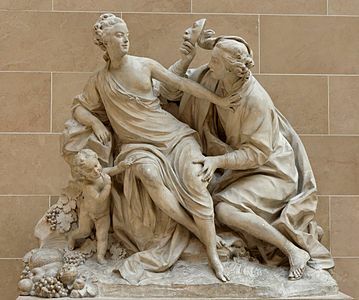 Étienne-Maurice Falconet (1716–1791) was another leading French sculptor during the period. Falconet was most famous for his statue of Peter the Great on horseback in St. Petersburg, but he also created a series of smaller works for wealthy collectors, which could be reproduced in a series in terra-cotta or cast in bronze. 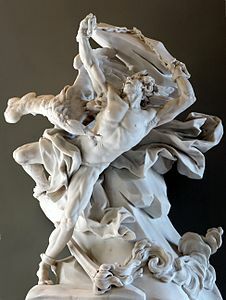 The French sculptors, Jean-Louis Lemoyne, Jean-Baptiste Lemoyne, Louis-Simon Boizot, Michel Clodion, Lambert-Sigisbert Adam and Jean-Baptiste Pigalle all produced sculpture in series for collectors. In Italy, Antonio Corradini was among the leading sculptors of the Rococo style. A Venetian, he travelled around Europe, working for Peter the Great in St. Petersburg, for the imperial courts in Austria and Naples. He preferred sentimental themes and made several skilled works of women with faces covered by veils, one of which is now in the Louvre. The most elaborate examples of rococo sculpture were found in Spain, Austria and southern Germany, in the decoration of palaces and churches. The sculpture was closely integrated with the architecture; it was impossible to know where one stopped and the other began. In the Belvedere Palace in Vienna, (1721-1722), the vaulted ceiling of the Hall of the Atlantes is held up on the shoulders of muscular figures designed by Johann Lukas von Hildebrandt. The portal of the Palace of the Marquis of Dos Aguas in Valencia (1715-1776) was completely drenched in sculpture carved in marble, from designs by Hipolito Rovira Brocandel. 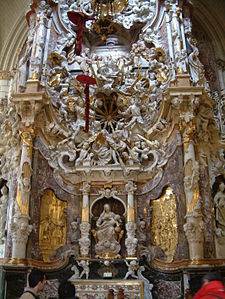 The El Transparente altar, in the major chapel of Toledo Cathedral is a towering sculpture of polychrome marble and gilded stucco, combined with paintings, statues and symbols. It was made by Narciso Tomé (1721-32), Its design allows light to pass through, and in changing light it seems to move. A new form of small-scale sculpture appeared, the porcelain figure, or small group of figures, initially replacing sugar sculptures on grand dining room tables, but soon popular for placing on mantelpieces and furniture. The number of European factories grew steadily through the century, and some made porcelain that the expanding middle classes could afford. The amount of colourful overglaze decoration used on them also increased. They were usually modelled by artists who had trained in sculpture. Common subjects included figures from the commedia dell'arte, city street vendors, lovers and figures in fashionable clothes, and pairs of birds. 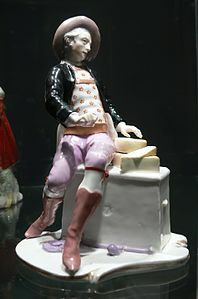 Johann Joachim Kändler was the most important modeller of Meissen porcelain, the earliest European factory, which remained the most important until about 1760. 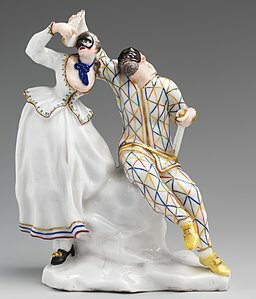 The Swiss-born German sculptor Franz Anton Bustelli produced a wide variety of colourful figures for the Nymphenburg Porcelain Manufactory in Bavaria, which were sold throughout Europe. 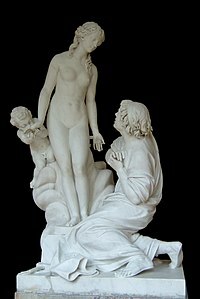 The French sculptor Étienne-Maurice Falconet (1716–1791) followed this example. While also making large-scale works, he became director of the Sevres Porcelain manufactory and produced small-scale works, usually about love and gaiety, for production in series. A Rococo period existed in music history, although it is not as well known as the earlier Baroque and later Classical forms. The Rococo music style itself developed out of baroque music both in France, where the new style was referred to as style galante ("gallant" or "elegant" style), and in Germany, where it was referred to as empfindsamer Stil ("sensitive style"). It can be characterized as light, intimate music with extremely elaborate and refined forms of ornamentation. Exemplars include Jean Philippe Rameau, Louis-Claude Daquin and François Couperin in France; in Germany, the style's main proponents were C. P. E. Bach and Johann Christian Bach, two sons of the renowned J.S. Bach. In the second half of the 18th century, a reaction against the Rococo style occurred, primarily against its perceived overuse of ornamentation and decoration. Led by C.P.E. Bach (an accomplished Rococo composer in his own right), Domenico Scarlatti, and Christoph Willibald Gluck, this reaction ushered in the Classical era. By the early 19th century, Catholic opinion had turned against the suitability of the style for ecclesiastical contexts because it was "in no way conducive to sentiments of devotion". Russian composer of the Romantic era Pyotr Ilyich Tchaikovsky wrote The Variations on a Rococo Theme, Op. 33, for cello and orchestra in 1877. Although the theme is not Rococo in origin, it is written in Rococo style. Rococo fashion was based on extravagance, elegance, refinement and decoration. Women's fashion of the seventeenth-century was contrasted by the fashion of the eighteenth-century, which was ornate and sophisticated, the true style of Rococo. These fashions spread beyond the royal court into the salons and cafés of the ascendant bourgeoisie. The exuberant, playful, elegant style of decoration and design that we now know to be 'Rococo' was then known as le style rocaille, le style moderne, le gout. A style that appeared in the early eighteenth-century was the robe volante, a flowing gown, that became popular towards the end of King Louis XIV's reign. This gown had the features of a bodice with large pleats flowing down the back to the ground over a rounded petticoat. The colour palate was rich, dark fabrics accompanied by elaborate, heavy design features. After the death of Louis XIV the clothing styles began to change. The fashion took a turn to a lighter, more frivolous style, transitioning from the baroque period to the well-known style of Rococo. The later period was known for their pastel colours, more revealing frocks, and the plethora of frills, ruffles, bows, and lace as trims. Shortly after the typical women's Rococo gown was introduced, robe à la Françoise, a gown with a tight bodice that had a low cut neckline, usually with a large ribbon bows down the centre front, wide panniers, and was lavishly trimmed in large amounts of lace, ribbon, and flowers. The Watteau pleats also became more popular, named after the painter Jean-Antoine Watteau, who painted the details of the gowns down to the stiches of lace and other trimmings with immense accuracy. Later, the 'pannier' and 'mantua' became fashionable around 1718, they were wide hoops under the dress to extend the hips out sideways and they soon became a staple in formal wear. This gave the Rococo period the iconic dress of wide hips combined with the large amount of decoration on the garments. Wide panniers were worn for special occasions, and could reach up to 16 feet (4.8 metres) in diameter, and smaller hoops were worn for the everyday settings. These features originally came from seventeenth-century Spanish fashion, known as guardainfante, initially designed to hide the pregnant stomach, then reimagined later as the pannier. 1745 became the Golden Age of the Rococo with the introduction of a more exotic, oriental culture in France called a la turque. This was made popular by Louis XV's mistress, Madame Pompadour, who commissioned the artist, Charles Andre Van Loo, to paint her as a Turkish sultana. In the 1760s, a style of less formal dresses emerged and one of these was the polonaise, with inspiration taken from Poland. It was shorter than the French dress, allowing the underskirt and ankles to be seen, which made it easier to move around in. Another dress that came into fashion was the robe a l'anglais, which included elements inspired by the males' fashion; a short jacket, broad lapels and long sleeves. It also had a snug bodice, a full skirt without panniers but still a little long in the back to form a small train, and often some type of lace kerchief worn around the neck. Another piece was the 'redingote', halfway between a cape and an overcoat. Accessories were also important to all women during this time, as they added to the opulence and the decor of the body to match their gowns. At any official ceremony ladies were required to cover their hands and arms with gloves if their clothes were sleeveless. Eszterháza in Fertőd, Hungary, 1720–1766, sometimes called the "Hungarian Versailles"
The Rococo Branicki Palace in Białystok, sometimes referred to as the "Polish Versailles"
^ "What is Rococo?". Victoria and Albert Museum. Retrieved 20 October 2018. ^ a b Ducher 1988, p. 136. ^ Owens 2014, p. 92. ^ "Rococo style (design) - Britannica Online Encyclopedia". Britannica.com. Retrieved 24 April 2012. ^ Marilyn Stokstad, ed. Art History. 4th ed. New Jersey: Prentice Hall, 2005. Print. ^ "Etymology of Rococo" (in French). Ortolong: site of the Centre National des Resources Textuelles et Lexicales. Retrieved 12 January 2019. ^ Ancien Regime Rococo Archived 11 April 2018 at the Wayback Machine. Bc.edu. Retrieved on 2011-05-29. ^ Rococo – Rococo Art. Huntfor.com. Retrieved on 2011-05-29. ^ Hopkins 2014, p. 92. ^ a b Ducher 1988, p. 144. ^ Riley, Noël. "The Age of Rococo." World Furniture. Secaucus, New Jersey: Chartwell, 1989. Print. ^ Hopkins, 2014 & pp. 92-93. ^ De Morant 1970, p. 382. ^ Kleiner, Fred (2010). Gardner's art through the ages: the western perspective. Cengage Learning. pp. 583–584. ISBN 978-0-495-57355-5. Retrieved 21 February 2011. ^ a b c de Morant 1970, p. 383. ^ Ducher 1988, pp. 150-153. 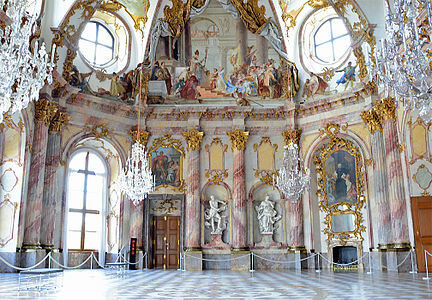 ^ https://www.bavaria.by/experiences/city-country-culture/castles-palaces/wuerzburg-residence; https://www.bavaria.by/experiences/city-country-culture/castles-palaces/wuerzburg-residence; B.M. Field The World's Greatest Architecture: Past and Present, Regency House Publishing Ltd, 2001. ^ Ducher 1988, p. 152. ^ Cabanne, 1988 & pp. 89–94. ^ "The Rococo Influence in British Art - dummies". dummies. Retrieved 2017-06-23. ^ Cabanne, 1988 & p. 106. ^ Cabanne 1988, p. 102. ^ a b c Cabanne 1988, p. 98. ^ a b Cabanne 1988, p. 104. ^ Rococo Style – Catholic Encyclopedia. Newadvent.org (1912-02-01). Retrieved on 2014-02-11. ^ "Posts about Baroque/Rococo 1650-1800 on History of Costume". ^ Coffin, S. (2008). Rococo: The continuing curve, 1730-2008. New York. ^ a b c "Marie Antoinette's Style Revolution". National Geographic. Retrieved 22 April 2018. ^ a b Glasscock, J. "Eighteenth-Century Silhouette and Support". The Metropolitan Museum of Art. Retrieved 22 April 2018. De Morant, Henry (1970). Histoire des arts décoratifs. Librarie Hacahette. Droguet, Anne (2004). Les Styles Transition et Louis XVI. Les Editions de l'Amateur. ISBN 2-85917-406-0. Prina, Francesca; Demartini, Elena (2006). Petite encylopédie de l'architecture. Paris: Solar. ISBN 2-263-04096-X. Hopkins, Owen (2014). Les styles en architecture. Dunod. ISBN 978-2-10-070689-1. Dictionnaire Historique de Paris. Le Livre de Poche. 2013. ISBN 978-2-253-13140-3. Vila, Marie Christine (2006). Paris Musique- Huit Siècles d'histoire. Paris: Parigramme. ISBN 978-2-84096-419-3. Marilyn Stokstad, ed. Art History. 3rd ed. New Jersey: Prentice Hall, 2005. Print. Kimball, Fiske (1980). The Creation of the Rococo Decorative Syle. New York: Dover Publications. ISBN 0-486-23989-6. Arno Schönberger and Halldor Soehner, 1960. The Age of Rococo. Published in the US as The Rococo Age: Art and Civilization of the 18th Century (Originally published in German, 1959). Levey, Michael (1980). Painting in Eighteenth-Century Venice. Ithaca: Cornell University Press. ISBN 0-8014-1331-1. Kelemen, Pál (1967). 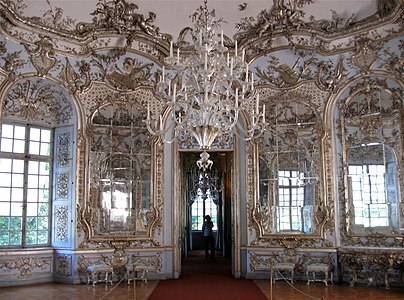 Baroque and Rococo in Latin America. New York: Dover Publications. ISBN 0-486-21698-5. All-art.org: Rococo in the "History of Art"
"Rococo Style Guide". British Galleries. Victoria and Albert Museum. Retrieved 16 July 2007. Barock- und Rococo- Architektur, Volume 1, Part 1, 1892(in German) Kenneth Franzheim II Rare Books Room, William R. Jenkins Architecture and Art Library, University of Houston Digital Library. 18th-century French art was dominated by the Baroque, Rocaille and neoclassical movements. Amalienborg (Danish pronunciation: [aˈmæːˀljənbɒːˀ]) is the home of the Danish royal family, and is located in Copenhagen, Denmark. It consists of four identical classical palace façades with rococo interiors around an octagonal courtyard (Danish: Amalienborg Slotsplads); in the centre of the square is a monumental equestrian statue of Amalienborg's founder, King Frederick V.
Amalienborg was originally built for four noble families; however, when Christiansborg Palace burned on 26 February 1794, the royal family bought the palaces and moved in. Over the years various kings and their families have resided in the four different palaces. The art of Europe, or Western art, encompasses the history of visual art in Europe. European prehistoric art started as mobile Upper Paleolithic rock and cave painting and petroglyph art and was characteristic of the period between the Paleolithic and the Iron Age. Written histories of European art often begin with the art of the Ancient Middle East and the Ancient Aegean civilizations, dating from the 3rd millennium BC. Parallel with these significant cultures, art of one form or another existed all over Europe, wherever there were people, leaving signs such as carvings, decorated artifacts and huge standing stones. However a consistent pattern of artistic development within Europe becomes clear only with the art of Ancient Greece, adopted and transformed by Rome and carried; with the Empire, across much of Europe, North Africa and the Middle East.The influence of the art of the Classical period waxed and waned throughout the next two thousand years, seeming to slip into a distant memory in parts of the Medieval period, to re-emerge in the Renaissance, suffer a period of what some early art historians viewed as "decay" during the Baroque period, to reappear in a refined form in Neo-Classicism and to be reborn in Post-Modernism.Before the 1800s, the Christian church was a major influence upon European art, the commissions of the Church, architectural, painterly and sculptural, providing the major source of work for artists. The history of the Church was very much reflected in the history of art, during this period. In the same period of time there was renewed interest in heroes and heroines, tales of mythological gods and goddesses, great wars, and bizarre creatures which were not connected to religion. Most art of the last 200 years has been produced without reference to religion and often with no particular ideology at all, but art has often been influenced by political issues, whether reflecting the concerns of patrons or the artist. A bail handle, or simply bail, is a handle that consists of an open loop that moves freely within two fixed mounts or ears. Several designs are available: bails are typically made of metal (wire) or plastic. It is a type of package handle which may be used for carrying an item, such as a tin can or bucket; or kettle, or as a drawer pull. A bail handle can also be used to hang an item such as a pharmaceutical bottle potted plants, etc. A flip-top closure on a bottle or jar is sometimes called a bail closure. Decorative bail handles appeared on pieces of French Rococo furniture during the early 18th century. These handles on drawers were rounded and hinged onto an escutcheon plate and hung down in the shape of a half moon or arch. Due to being hinged, they were able to move up and down and they were usually elaborately decorated. The Baroque (UK: , US: ) is a highly ornate and often extravagant style of architecture, music, painting, sculpture and other arts that flourished in Europe from the early 17th until the mid-18th century. It followed the Renaissance style and preceded the Rococo (in the past often referred to as "late Baroque") and Neoclassical styles. It was encouraged by the Catholic Church as a means to counter the simplicity and austerity of Protestant architecture, art and music, though Lutheran Baroque art developed in parts of Europe as well. The Baroque style used contrast, movement, exuberant detail, deep colour, grandeur and surprise to achieve a sense of awe. The style began at the start of the 17th century in Rome, then spread rapidly to France, northern Italy, Spain and Portugal, then to Austria and southern Germany. By the 1730s, it had evolved into an even more flamboyant style, called rocaille or Rococo, which appeared in France and central Europe until the mid to late 18th century. Calamarca (Hispanicized spelling) or Qala Marka (Aymara qala stone, marka village, town, place, land, "place of stone") is a town in the La Paz Department in Bolivia. It is the seat of Calamarca Municipality, the fourth municipal section of Aroma Province. It lies on the Altiplano on the east side of the main road between La Paz and Patacamaya, about 60 km south of La Paz.Calamarca has a late 16th-century church with a silver altar worked in a rococo style, and two rococo altar pieces. It also contains colonial paintings. Charlottenburg Palace (German: Schloss Charlottenburg) is the largest palace in Berlin, Germany. It is in the Charlottenburg district of the Charlottenburg-Wilmersdorf borough. The palace was built at the end of the 17th century and was greatly expanded during the 18th century. 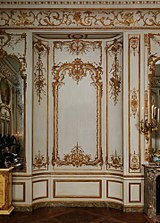 It includes much lavish internal decoration in baroque and rococo styles. A large formal garden surrounded by woodland was added behind the palace, including a belvedere, a mausoleum, a theatre and a pavilion. During the Second World War, the palace was badly damaged but has since been reconstructed. The palace with its gardens are a major tourist attraction. Christian's Church (Danish: Christians Kirke) is a magnificent Rococo church in the Christianshavn district of Copenhagen, Denmark. Designed by Nicolai Eigtved, it was built 1754–59. The church was originally built by the German community as a church for the large German community at Christianshavn and served this purpose until the end of the 19th century. Today it is a regular parish church for Christian's Parish within the Danish National Church. Its name is a reference to King Christian IV. who founded the Christianshavn district in 1611. Frederik's Church (Danish: Frederiks Kirke), popularly known as The Marble Church (Marmorkirken) for its rococo architecture, is an Evangelical Lutheran church in Copenhagen, Denmark. The church forms the focal point of the Frederiksstaden district; it is located due west of Amalienborg Palace. Jean-Honoré Fragonard (French: [ʒã onoʀe fʀaɡonɑʀ]; 4 April 1732 – 22 August 1806) was a French painter and printmaker whose late Rococo manner was distinguished by remarkable facility, exuberance, and hedonism. One of the most prolific artists active in the last decades of the Ancien Régime, Fragonard produced more than 550 paintings (not counting drawings and etchings), of which only five are dated. Among his most popular works are genre paintings conveying an atmosphere of intimacy and veiled eroticism. Stanley House (Danish: Stanleys Gård) is a Rococo mansion overlooking Christianshavn Canal in the Christianshavn neighbourhood of Copenhagen, Denmark. The house takes its name after its founder, Simon Carl Stanley, and was possibly built to his own design. The Suburbs is the third studio album by Canadian indie rock band Arcade Fire, released on August 2, 2010. Coinciding with its announcement, the band released a limited edition 12-inch single containing the title track and "Month of May". The album debuted at No. 1 on the Irish Albums Chart, the UK Albums Chart, the US Billboard 200 chart, and the Canadian Albums Chart. It won Album of the Year at the 2011 Grammy Awards, Best International Album at the 2011 BRIT Awards, Album of the Year at the 2011 Juno Awards, and the 2011 Polaris Music Prize for best Canadian album. Two weeks after winning Grammy's Album of the Year, the album jumped from No. 52 to No. 12 on the Billboard 200, the album's highest ranking since August 2010.Arcade Fire released a deluxe edition CD/DVD of The Suburbs on June 27, 2011 (everywhere except the U.S. and Canada). The American and Canadian versions were released on August 2, 2011, to coincide with the original album's anniversary. The new version included two brand new tracks recorded during The Suburbs album sessions ("Culture War" and "Speaking in Tongues", the latter featuring David Byrne), an extended version of album track "Wasted Hours", Spike Jonze's short film, Scenes from the Suburbs, and an 80-page booklet as well as other exclusive content. The Variations on a Rococo Theme, Op. 33, for cello and orchestra was the closest Pyotr Ilyich Tchaikovsky ever came to writing a full concerto for cello and orchestra. The style was inspired by Mozart, Tchaikovsky's role model, and makes it clear that Tchaikovsky admired the Classical style very much. However, the Theme is not Rococo in origin, but actually an original theme in the Rococo style. Tchaikovsky wrote this piece for and with the help of Wilhelm Fitzenhagen, a German cellist and fellow-professor at the Moscow Conservatory. Fitzenhagen gave the premiere in Moscow on November 30, 1877, with Nikolai Rubinstein conducting. This was perhaps the only hearing of the Variations as Tchaikovsky wrote the piece, until 1941, when it was played in Moscow without Fitzenhagen's by-then-standard emendations. Waddesdon is a village within the Aylesbury Vale district in Buckinghamshire, England, 6 miles from Aylesbury on the A41 road. The centre of a civil parish, which also includes the hamlets of Eythrope and Wormstone, Waddesdon was an agricultural settlement with milling, silk weaving and lace making enterprises.